Investors in Canopy Growth Corp. (TSX:WEED)(NYSE:CGC) might be feeling a little bit bored at the moment. The stock seems to have come to a standstill in the last few weeks, as the company is no longer making those huge announcements that seemed to hit headlines every couple of days not too long ago. While the stock is exciting and there is plenty to look forward to, it’s the future of this company that investors can forward to. But it’s not the only marijuana stock to get excited about. Investors in Canopy Growth Corp. (TSX:WEED)(NYSE:CGC) might be feeling a little bit bored at the moment. The stock seems to have come to a standstill in the last few weeks, as the company is no longer making those huge announcements that seemed to hit headlines every couple of days not too long ago. While the stock is exciting and there is plenty to look forward to, it’s the future of this company that investors can forward to. But it’s not the only marijuana stock to get excited about. 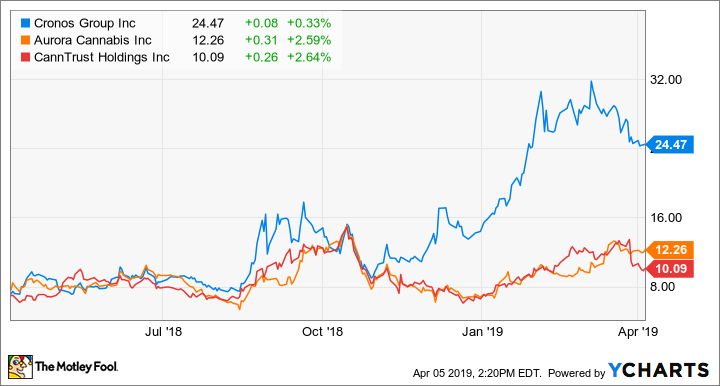 Canada’s largest marijuana producer, Aurora Cannabis Inc. (TSX:ACB)(NYSE:ACB) has been firmly in the number two spot right behind Canopy for a while now. And the company also has had a few announcements recently to get investors’ juices flowing. Shares of Aurora rose 2% this week after the company announced that it had won a public tender out of 79 participating companies to cultivate and distribute marijuana for medical purposes in Germany. The deal should be formalized by April 17. Other things driving this stock are of course its high production rate of 500,000 kilograms per year and sales and operations in 24 countries and counting. Its Q4 results weren’t bad either, with the company announcing revenue of $54.18 million for the quarter, beating analysts’ estimates of $52.13 million. This revenue came in with help from the company’s acquisitions of CanniMed and MedReleaf, allowing it to deliver its second-highest year-over-year revenue growth. Another smaller, but still exciting, cannabis producer is CannTrust Holdings Inc. (TSX:TRST)(NYSE:CTST). The exciting part is how CannTrust produces marijuana, and that’s through hydroponics. At its flagship facility in Niagara, the company can grow plants in nutrient-rich water solvent rather than soil. Better still? CannTrust has cheap access to water and electricity, offering superior marijuana per gram at incredibly low production costs. In addition, CannTrust won a 390,000-square-foot expansion of its Niagara facility. The facility is already 450,000 square feet, allowing the company to produce about 100,000 kilograms of marijuana per year with the addition. But that’s not all, as the company still plans on acquiring 200 acres of land to grow the old-fashioned way and produce another 100,000 to 200,000 kilograms of cannabis per year. This is all happening after some less than stellar news from CannTrust. Its Q4 results failed to live up to the Wall Street hype. Despite sales rising by more than 132%, the company reported a heavy loss of about $25.5 million. The stock took a nose dive with the news, but has now put the company in a position where investors can buy on the cheap. If you’ve been following cannabis headlines, you’ll be more than aware that Cronos Group Inc. (TSX:CRON)(NASDAQ:CRON) partnered with Altria back in December, with the company acquiring 45% ownership stake in Cronos. This put $1.8 billion of cash into Cronos’ pockets, putting it in spot three among cannabis producers and behind only Canopy Growth for largest cash position. But it’s what the company does with the money that matters, and Cronos needs to to execute its long-term strategy. And it looks like Cronos could be on a path to success after the company’s latest results. Q4 for Cronos was a mixed bag, with revenue growing to $5.6 million, an increase of 248% for the quarter driven mainly by the adult-use market. However, the company also reported gross profit growth of only 55% and a net loss of $19.16 million. So while this can be an exciting stock, I’d wait a bit more to see what Cronos’ plans are for that $1.8 billion. Fool contributor Amy Legate-Wolfe owns shares of Aurora Cannabis and Canopy Growth.